Schumi0101: BMTC’s Electric Bus ride. 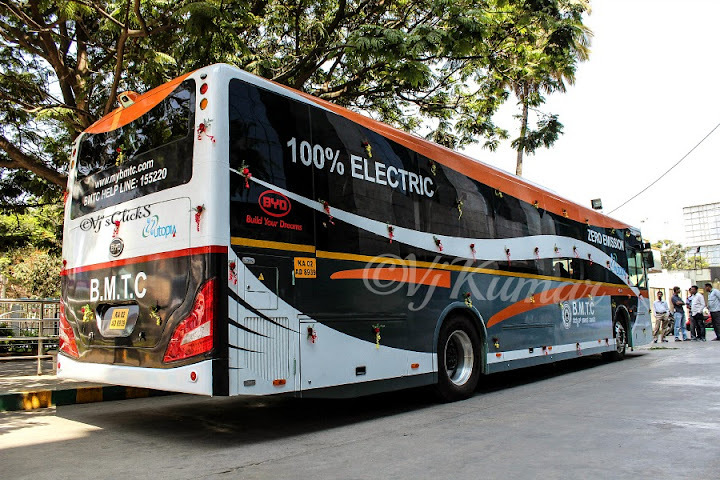 Finally after a lot of misses, I had my chance to make try the all new Electric Bus of BMTC. Though I had seen the bus on multiple occasions and was also a part of the inauguration, this was my first chance to try the service. I boarded the bus and took my seat at the rear of the bus. As I was eagerly looking at the interiors of the bus, it roared to life. The bus has been constantly compared to Volvo however; the bus is nothing as ‘Volvo’ like. Manufactured by BYD, a Chinese coach company, the bus has 32 seats and a provision for wheelchair occupant. The bus is spacious inside and the leg room is almost the same when compared with the conventional a/c buses that ply in the city. Due to my time constraints, I had to wait for some time before I could try this service. Finally after almost a month, I had an opportunity to try this service and caught this bus at Kadugodi. The bus was waiting for departure and I boarded the bus immediately. After a couple of minutes we departed from Kadugodi and picked up speed immediately. The whistling noise inside the bus generated by the motors to power the bus was something different to hear. Unlike the conventional diesel buses, this bus has very low vibrations when on the move. And one thing which as a traveler you will have to get used to is the silence inside the bus when the bus comes to a halt at signals and bus stops. The bus has absolutely no vibrations when it is stopped. The cooling effect of the a/c was also appreciable. The bus was center of attraction all along and kept the attention of curious onlookers. Almost every signal or a bus stop we stopped at, she drew attention of the people. While some gleamed with curiousness, others took pictures of the bus. We reached ITPL and infront of us was a beeline of 335E Volvos. However, she stood out in the lot and many passengers decided to try the bus. The traffic filled streets of Bangalore was not making anything easy for the bus however, the driver was able to handle the bus with ease. It took almost 1.5hrs to cover the total distance. Finally she pulled inside the Platform number 1 of Kempegowda Bus Stand where the waiting BYD officials welcomed the bus. 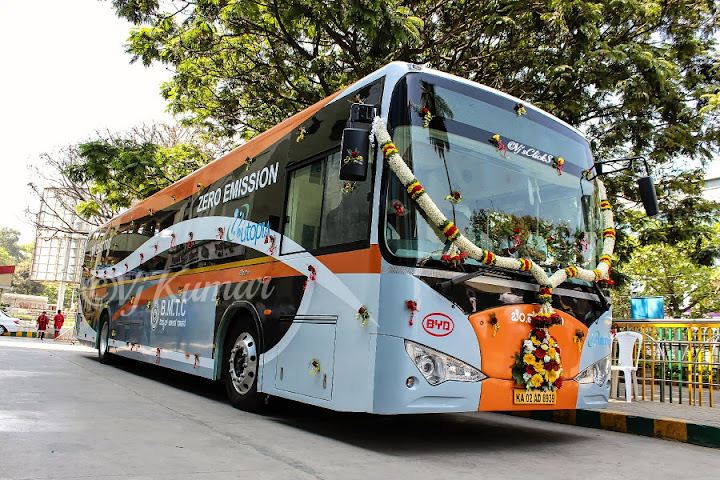 My journey with India’s first electric bus was over. My friend who has tried this service earlier had a chance to speak with the crew. He said both the passengers of this bus and crew shared positive response. However, this bus comes with a cost. The bus costs around 2.7crores, almost 1.5-1.7crores costlier than a Volvo bus. The benefits however is that the bus runs 250kms per charge and the operational costs of running these buses are very less when compared to the regular a/c buses. The bus which is currently running as a trial will give BMTC ample amount of time to decide upon acquiring these beauties. 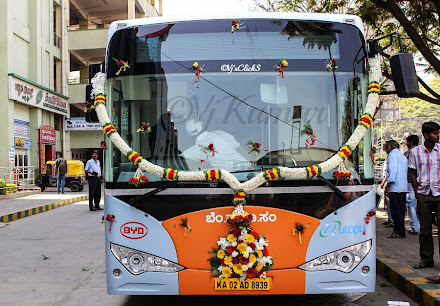 If BMTC goes ahead and acquires these buses, it would definitely bring a relief to the chocking city which is filled with pollution and traffic.